How Regressive Is the Mayor's Sales Tax Proposal for Homelessness? The sales tax is regressive, but experts say just slightly more so than a Seattle property tax. Seattle mayor Ed Murray in November 2014 at the Cascade Bicycling Center. 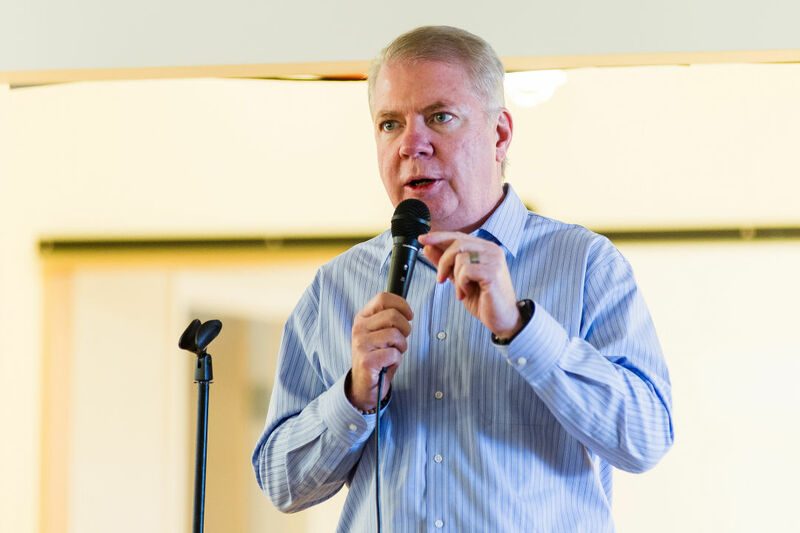 Seattle mayor Ed Murray, along with King County officials, announced on Monday plans to scrap the city property tax to fight homelessness, raising concerns that the substitute plan—a county-wide 0.1 percent sales tax—is more regressive. "We have lousy taxation options here," said Daniel Malone, executive director of the Downtown Emergency Service Center who worked with the city on the property tax measure. "They're virtually all regressive in one way or another." Using 2015 data, the study showed the poorest 20 percent of the state—less than $21,000 in annual family income—pays 16.8 percent of their income to taxes. The most wealthy 1 percent—$507,000 or more—pays only 2.4 percent. And it's no question for experts that a sales tax hits lower-income people harder. Poorer people pay a larger portion of their income, assuming there's no way to avoid buying essential goods and services. "Sales taxes are extremely regressive," said Susan Weihrich, associate professor of accounting at Seattle University. More sales taxes leave low-income people with less money to buy products (or homes). "It's just a vicious cycle that we're in here." But how much more regressive is a sales tax than a property tax? That answer can be a little more complicated, said Justin Marlowe, endowed professor of public finance and civic engagement at the University of Washington. He said there aren't solid numbers on how much of the property taxes end up falling on renters. "Potentially making [the tax system] more regressive is always a problem," Marlowe said. But funding services through property taxes is "not necessarily a more progressive way" because there are lots of ways high-income families get around paying property taxes—like, for example, making renters pay them. In a high-demand housing area like Seattle, Weihrich said, landlords can get away with raising their rent when property taxes rise. Marlowe points to a few reasons a county-wide sales tax would be more enticing politically, one of which was brought up by Murray as well: more money. An estimated $68 million would be raised with a county-wide sales tax in the first year, as opposed to the city property tax's $55 million a year. A county-wide property tax for homelessness is not uncommon, Marlowe said, and might make sense since property owners are thought to benefit the most from better housing and homelessness programs. But such a measure wouldn't bode well in King County, which extends well beyond Seattle into more rural areas. Those voters are far less enthusiastic about a property tax and much more receptive to a sales tax. "To get voter approval for a county-wide property tax is very difficult," Marlowe said. Murray said Monday that the sales tax allows more "data-driven" regional cooperation between the county and city to tackle a "regional problem." He said it also provides for more time to reform homelessness programs, since the sales tax measure won't be included until the August 2018 ballot. Malone said he's worried that could mean a delay in new homeless services. "What we are pushing for is for the city and county together to figure out a way to bridge this period of time," Malone said. He said he didn't find out until Friday that the campaign for a property tax was over essentially before it began. "I was initially disappointed because I'm pretty sure we would've won. We would've succeeded in getting it done." And he's concerned voters won't be receptive to another sales tax after the county already proposed one on the 2017 ballot for arts funding. Could voters approve a second sales tax just a year later? Marlowe said he thinks they could feed off each other and both pass. They can appeal to different groups of voters, he said, and no one would feel good about voting to fund arts but not homelessness. "There's definitely a psychology to these things," Marlowe said. "The homelessness issue seems to be visible and acute in enough places in the county." In this case, that means even more sales taxes. Both Marlowe and Weihrich said the tax system isn't going to get much better unless there's an income tax, and voters struck down statewide income tax measures eight times since 1935. The last time it was tried in 2010, 64 percent of voters opposed it. Updated April 5, 2017, at 4:41pm: This post is corrected to say King County proposed a sales tax for arts funding. The ordinance was deferred in the Budget and Fiscal Management Committee on March 22.